When it comes to a biopic, it is very important for the actor playing the title role to have done immense research to portray the role on the silver screen. Just like that, Shraddha Kapoor who will be featuring in her first biopic of Haseena Parkar, went through great first hand research. The actress who would be playing the intense character of Haseena Parkar spent a lot of time in the pace she lived in, Nagpada. Haseena Parkar known as the Aapa of Nagpada had a huge role to play in the life of the people living there, who had seen the journey of the woman and some were even part of it. While going through the learning of Haseena as a person, Shraddha and director Apoorva Lakhia decided that it would be great practice to meet the real people who has seen Haseena and lived around her. For a week, everyday Shraddha visited Nagpada. She visited the real house of Haseena and met her family and grand children. The actress even spoke to people who were there during the incident which took place with Ibrahim Parkar, husband of Haseena Parkar which is being played by Ankur Bhatia. The actress was keen to know experiences which individuals from Nagpada had when she was alive. Apoorva who spent time with the real Haseena made sure that Shraddha gets to know all sides of Haseena Parkar which she has played extremely well which is seen in the trailer and the promos of the films so far. 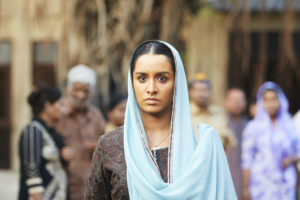 Sources attached to the film claim that in order to get a feel of Nagpada and Haseena’s way of life, Shraddha wore a burkha and visited the neighbourhood. The actress also met Haseena’s family members to get insights about her life and personality. Shraddha claims that exploring Nagpada incognito helped her a lot to understand her character and the world that she grew up in. Swiss Entertainment presents Apoorva Lakhia’s Haseena Parkar co-produced by Sameer Antulay & Babu Tyagi starring Shraddha Kapoor, Siddhanth Kapoor and Ankur Bhatia is set to release on 22nd September 2017.